My Country is the best. The Sparkling Stars of Witty World Bhilwara celebrated the 70 th Independence Day on Friday, August 12,2016. The children came dressed in the colours of the Flag orange, white and green and were thrilled to see their classrooms decorated with tri colour balloons and streamers. The little ones presented a short programme to show their love and gratitude for their country. 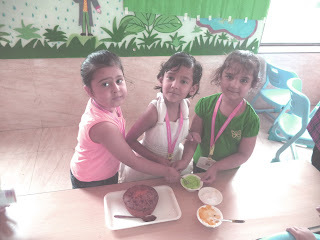 They made tri colour collages, decorated tri colour cake and made tri colour sandwich. Teachers tied tri colour ribbons on the kids wrists and made tri colour tattoos on their cheeks.